are there any hints on configging, guns, pilot skills, etc? Edited by trikke, 11 September 2018 - 11:53 AM. Here is mine. I don't do awesome in it, but better than the Me-410. I load ordinance because it doesn't affect what I do with the plane. I don't dogfight and I can flip sectors with bombs. Rockets are fun to shove up the tailpipe of bombers. that's right, i said science... cold, objective science google it! i'm stuck with the 37mm on the F because it's specced, but i'm downgrading the J's 37mm to 23mm, to go with the four 50cals... hope that helps me later today! DONT DO IT!!!!! The 23mm fires faster but the big gun is where its at. And no rockets???? Your missing out on all the fun and advantages that it has over the German heavies. The Me 410 may have bigger rockets but it only has 4 of them so they are hardly worth using. The J is one of my best planes so here are some fun ways to use it in no particular order. 1- attacking bomber flights- Fire your guns at a bomber until you are directly behind it. your tracers will show you if you are at an angle. once you are directly behind it rapid fire At LEAST 4 rockets at it.....BOOM! You have enough rockets to get the rocket medal in one load. Don't expect it every time but its so much fun. Recommend the rocket skill and demo expert skill. 2- water map garrisons. It only takes 3 rockets to kill a ship. dive down to lowest altitude you feel comfortable and pull out. you should be looking at the ship about level. fire 3 rockets. you will be heading into land at this point and FAST. Drop a bomb on AA site. turn parallel over the land. drop 2nd bomb on aa site. turn back out to sea and you will be looking at another ship so guess what? 3 more rockets. That's 4 ground targets destroyed and you are in and out before the defenders even have a chance to counter attack you. 4- Heavy hunter. The p38 has the highest speed rating AND maneuverability rating of all the heavies so put your dog fighting skills to use and hunt other heavies or heavy air defence. 5- stoop attack. 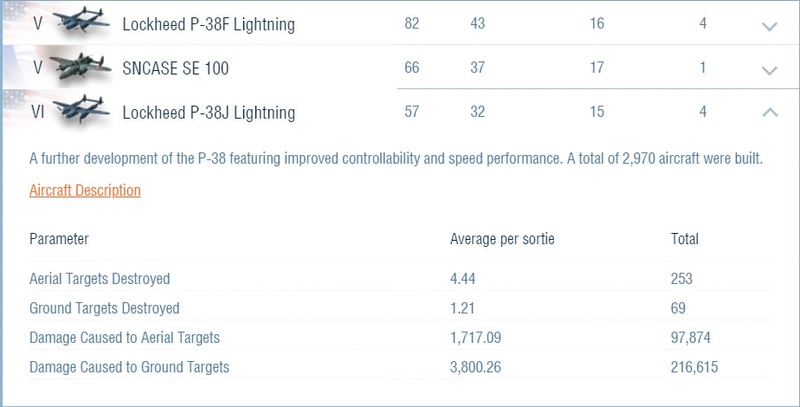 after you have cleared out the heavies on over watch the p38 has the highest altitude rating so you will be high above and out of reach of all the little fighter peons below you. select the stoop attack skill and dive down on them you will take them completely unaware. once you have a critical hit on them with your stoop attack they cant turn worth a crap and you can take your time finishing them off at your leisure. That is if they didn't completely blow apart on your first attack. 7-ground attack. now that you have killed everything else ga are all that's left. they make easy targets and if you haven't got the rocket medal on the bombers you can do it now the same way. or you could fly over top of them from behind and drop a bomb in front of them to get your bombardier badge. Old news, so take with a grain of salt. I can honestly say that the p-38J is new to me. I got the p-39F in my first week playing the game (its just such a classic and i loved it years ago in CFS3), and meh, I gravitated towards light fighters, and acquired the F7F through the mustang line. However recently I've come back and have fallen in love with the P-38F (and SE 100), and I must admit, I have fallen for the P-38J too. Mine isn't specialized, but it will be soon. I liked the 23mm, but I'll add to the chorus, you've got to go with the 37mm it really is good. I complement it with all the ordnance I can cram on it, and its a blast. To complement that gun choice, I've gone with long gun barrels to extend the range of the guns, since the .50s and 37 are fairly short range (plus it doesn't hurt accuracy). My 2nd and 3rd skills are/will be the 2 marksman skills to further enhance accuracy and I will get a sight when specialized. The thing is glorious, and the ordinance allows you to cap things easily. If you have even a little help you can take a plant since you can get it half way there with your own ordinance. Then set up to attack enemy intruders for more cap points or move on to the next objective. The speed an maneuverability mean that you can chase and kill other heavies fairly reliably. As a general rule however, unless you can be sure of a kill, have significant backup watching your six or the enemy is completely focused on another target, do not attack human fighters or even many multiroles unless you have a significant altitude advantage and can use a dive to build up speed, and have a reserve of boost to escape. One great thing is its ability to climb rapidly, and its good ceiling. During the invasion game mode in particular I found that there were quite a few games where I was the only one on the team who could get up high enough to take out the enemy human high alt bombers. yeah, state of mind (inc confidence) can have a big impact on performance. I don't have the 410, so I can't compare, although I have heard it's supposed to be the best t6 heavy. Studies show a cool paintjob increases performance by 25% too. So this thread made me start playing my P-38J in order to get the 100 gold for the heavy mission. I re-discovered a love for this pixel plane. I decided a few weeks ago to play all my multi-role and heavies in the max configuration should I choose to specialize them. So even with all bombs and rockets this thing still climbs like a beast and chews up fighters, bombers, heavy fighters, etc. You can take it low to cap a command center and then zoom up high to take out a bomber. My pilot is not too skilled as I think I moved the original pilot to another plane so with time it will get better. All in all, if you play it boom and zoom with a mix of capping a stubborn cap, I like it again and will probably play it more often. To each his own, I guess, but all in all, I think this is a strong plane at tier. I love the J because it is so bloody fast. My favorite HF is the 410, but my J will eat 410s for breakfast. If I see a J when flying my 410, I know that I am going to have to crit it or kill it outright on the first pass, or there will be trouble in my immediate future. 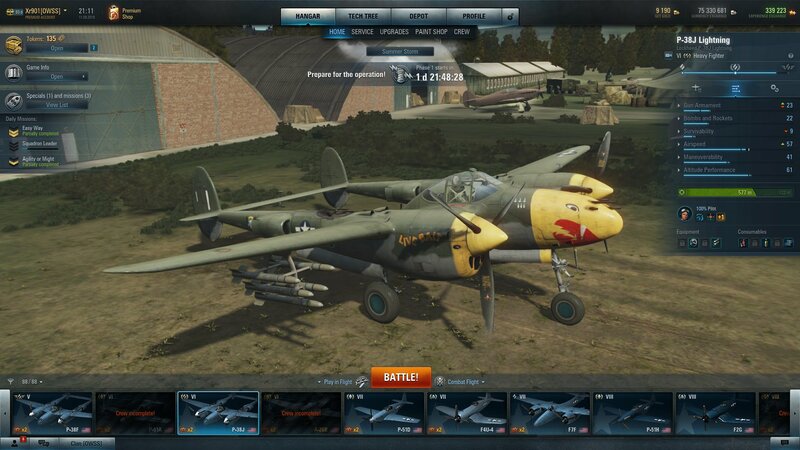 The P-38J is also great when going after bombers - those rockets make short work of any flying straight and level. I also like it as a light GAA, because it can take a garrison and an airfield solo pretty easily, make large dents in CC and military bases, and like was said above, give good progress on a mining plant. I love dropping ordnance on a MP, then zooming up to kill the bomber, then back down to flip the cap by killing GAA. you, sir, are a connoisseur of fine aerial art! i don't fly any plane without garish nose-zart! I started this game to play Lightnings. Still my favorite plane to fly, right up there with the Flapjack. Historical note, the J did have bigger engines, but also weighed more, so the performance stayed pretty much the same speed wise. Seconds to all the above comments regarding BnZ and rockets, either Lightning is a beast if played correctly. However recently I've come back and have fallen in love with the P-38F (and SE 100), and I must admit, I have fallen for the P-38J too. Mine isn't specialized, but it will be soon. you tore us up this week in it... killed our entire team and had enough time left over to pick our bones clean! It only takes 3 rockets to kill a ship. Two should do the trick ; most AA ships have armored parts (white square) and soft parts (white circle), I launch 2 rockets at the armored parts and take out the soft parts with my guns (20mm or better). Reading this I should really try the P-38 again ... I really wanted the Lightnings but gave up after researching the J (on EU server) and am working to the Pancake via the Corsair line and F7F. Since then I've got some more experience with heavies (Beaufighter, Me-410, Bf-109 Z, F7F ...) so maybe this time I'll get the hang of flying them. Edited by GonerNL, 27 September 2018 - 09:24 AM.